Escape the urban bustle at Elizabeth Lake, Yosemite National Park and Yosemite Ski and Snowboard Area. 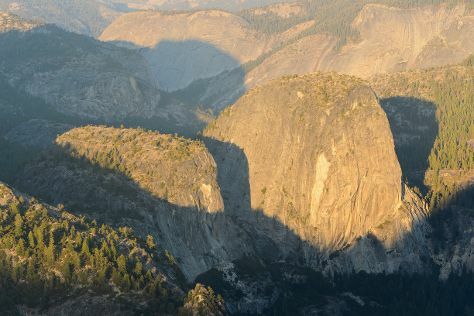 Next up on the itinerary: explore the striking landscape at Glacier Point, hike along North Dome, grab your bike and head to Yosemite Valley Biking, and make a trip to Yosemite Conservation Heritage Center. To see ratings, photos, and more tourist information, use the Yosemite National Park trip builder tool . Sydney, Australia to Yosemite National Park is an approximately 19.5-hour combination of flight and car. You can also do a combination of flight, subway, bus, and taxi; or do a combination of flight, bus, and taxi. The time zone difference moving from Australian Eastern Standard Time (New South Wales) to Pacific Standard Time is minus 18 hours. Traveling from Sydney in March, things will get much colder in Yosemite National Park: highs are around 13°C and lows about -5°C. Wrap up your sightseeing on the 24th (Sun) to allow time to drive to San Francisco. Start off your visit on the 25th (Mon): take a stroll through Twin Peaks, snap pictures at Golden Gate Bridge, then take in the waterfront at Fisherman's Wharf, and finally step off the mainland to explore Alcatraz Island. To see more things to do, reviews, photos, and other tourist information, read San Francisco itinerary planner. Traveling by car from Yosemite National Park to San Francisco takes 4 hours. Alternatively, you can do a combination of car and flight; or do a combination of bus and flight. When traveling from Yosemite National Park in March, plan for a bit warmer days and much hotter nights in San Francisco: temperatures range from 21°C by day to 11°C at night. Finish up your sightseeing early on the 25th (Mon) so you can travel to Yellowstone National Park. On the 26th (Tue), stroll through Elephant Back Mountain, witness a stunning natural landmark at Grand Geyser, and then take in the natural beauty of Aurum Geyser. 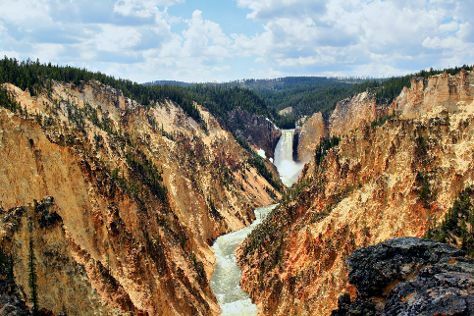 On the next day, explore the stunning scenery at Grand Canyon of the Yellowstone, then trek along North Rim Trail, and then get impressive views of Monument Geyser Basin. To find reviews, where to stay, and more tourist information, refer to the Yellowstone National Park online trip builder . You can do a combination of flight and car from San Francisco to Yellowstone National Park in 6 hours. Alternatively, you can do a combination of flight, shuttle, and car; or drive. You'll lose 1 hour traveling from San Francisco to Yellowstone National Park due to the time zone difference. Traveling from San Francisco in March, expect Yellowstone National Park to be colder, temps between 2°C and -14°C. Cap off your sightseeing on the 27th (Wed) early enough to travel to New York City. Start off your visit on the 28th (Thu): take in panoramic vistas at Empire State Building, then go for a walk through Central Park, and then contemplate the long history of 9/11 Memorial. Get ready for a full day of sightseeing on the next day: take some stellar pictures from Top of the Rock, then make a trip to Grand Central Terminal, and then admire the masterpieces at The Metropolitan Museum of Art. To find traveler tips, ratings, more things to do, and more tourist information, refer to the New York City tour itinerary planner. Traveling by combination of car, flight, and bus from Yellowstone National Park to New York City takes 9 hours. Alternatively, you can do a combination of bus, shuttle, and flight; or drive. The time zone difference when traveling from Yellowstone National Park to New York City is 2 hours. Traveling from Yellowstone National Park in March, expect nights in New York City to be much warmer, around 1°C, while days are somewhat warmer, around 11°C. Wrap up your sightseeing on the 29th (Fri) early enough to travel to Grand Canyon National Park. On the 30th (Sat), explore the stunning scenery at Yavapai Point, then hike along Rim Trail, and then take in breathtaking views at Grand Canyon South Rim. Get ready for a full day of sightseeing on the 31st (Sun): hike along Bright Angel Trail. To see traveler tips, photos, where to stay, and tourist information, refer to the Grand Canyon National Park trip planning app . Traveling by combination of bus and flight from New York City to Grand Canyon National Park takes 12.5 hours. Alternatively, you can do a combination of flight and bus; or drive. The time zone difference moving from Eastern Standard Time (EST) to Mountain Standard Time (MST) is minus 2 hours. When traveling from New York City in March, plan for somewhat warmer days in Grand Canyon National Park, with highs around 16°C, while nights are little chillier with lows around -5°C. Wrap up your sightseeing on the 31st (Sun) early enough to travel to Las Vegas. Start off your visit on the 1st (Mon): take in breathtaking views at Red Rock Canyon National Conservation Area, then admire the natural beauty at Bellagio Conservatory & Botanical Gardens, then admire the local landmark of Bellagio Fountains, and finally see the interesting displays at The Mob Museum. To find where to stay, ratings, photos, and more tourist information, read Las Vegas road trip website . Do a combination of flight and car from Grand Canyon National Park to Las Vegas in 4.5 hours. Alternatively, you can drive; or take a shuttle. You'll gain 1 hour traveling from Grand Canyon National Park to Las Vegas due to the time zone difference. Traveling from Grand Canyon National Park in March, you will find days in Las Vegas are a bit warmer (27°C), and nights are much hotter (13°C). Cap off your sightseeing on the 1st (Mon) early enough to travel to Honolulu. Start off your visit on the 2nd (Tue): kick back and relax at Waikiki Beach, then go for a walk through Diamond Head State Monument, and then look for all kinds of wild species at Hanauma Bay Nature Preserve. To find traveler tips, more things to do, and other tourist information, you can read our Honolulu online attractions planner . Getting from Las Vegas to Honolulu by flight takes about 9 hours. Due to the time zone difference, you'll gain 2 hours traveling from Las Vegas to Honolulu. Traveling from Las Vegas in April, Honolulu is a bit warmer at night with lows of 25°C. On the 3rd (Wed), you'll have the morning to explore before heading back home.